SHANGRI-LA #4 10¢ ea. 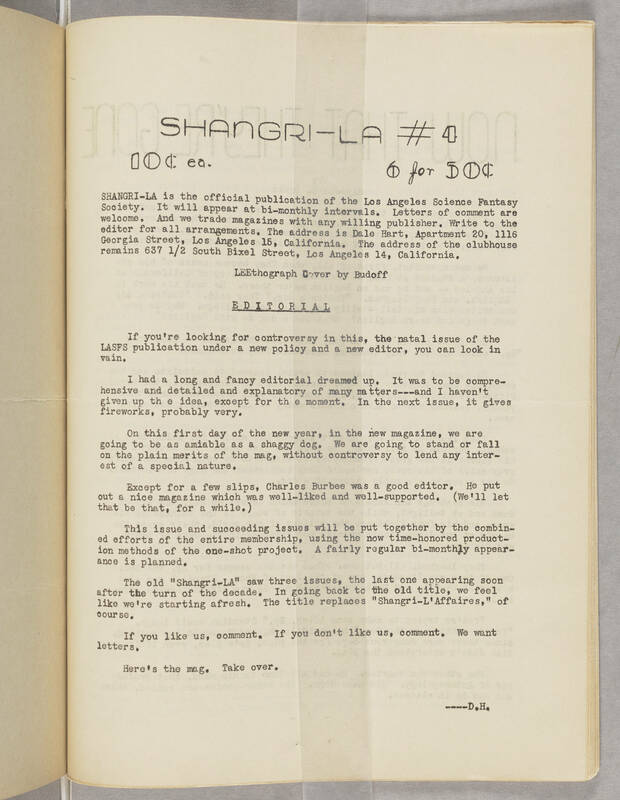 6 for 50¢ SHANGRI-LA is the official publication of the Los Angeles Science Fantasy Society. It will appear at bi-monthly intervals. Letters of comment are welcome. And we trade magazines with any willing publisher. Write to the editor for all arrangements. The address is Dale Hart, Apartment 20, 1116 Georgia Street, Los Angeles 15, California. The address of the clubhouse remains 637 1/2 South Bixel Street, Los Angeles, 14, California. LEETthograph Cover by Budoff EDITORIAL If you're looking for controversy in this, the natal issue of the LASFS publication under a new policy and a new editor, you can look in vain. I had a long and fancy editorial dreamed up. It was to be comprehensive and detailed and explanatory of many matters---and I haven't given up th e idea, except for th e moment. In the next issue, it gives fireworks, probably very. On this first day of the new year, in the new magazine, we are going to be as amiable as a shaggy dog. We are going to stand or fall on the plain merits of the mag, without controversy to lend any interest of a special nature. Except for a few slips, Charles Burbee was a good editor. He put out a nice magazine which was well-liked and well-supported. (We'll let that be that, for a while.) This issue and succeeding issues will be put together by the combined efforts of the entire membership, using the now time-honored production methods of the one-shot project. A fairly regular bi-monthly appearance is planned. The old "Shangri-LA" saw three issues, the last one appearing soon after the turn of the decade. In going back to the old title, we feel like we're starting afresh. The title replaces "Shangri-L'Affaires," of course. If you like us, comment. If you don't like us, comment. We want letters. Here's the mag. Take over. ----D.H.